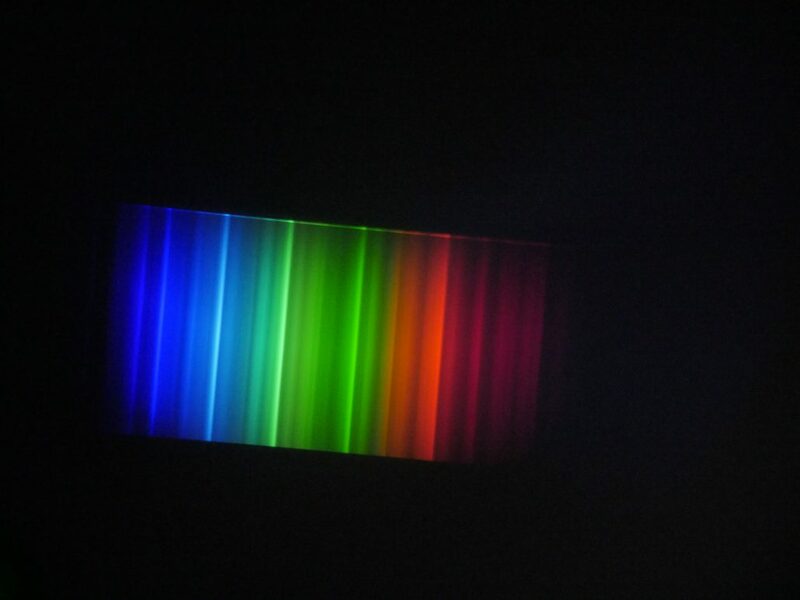 Congratulations on making it to the Light page of Science for Families! 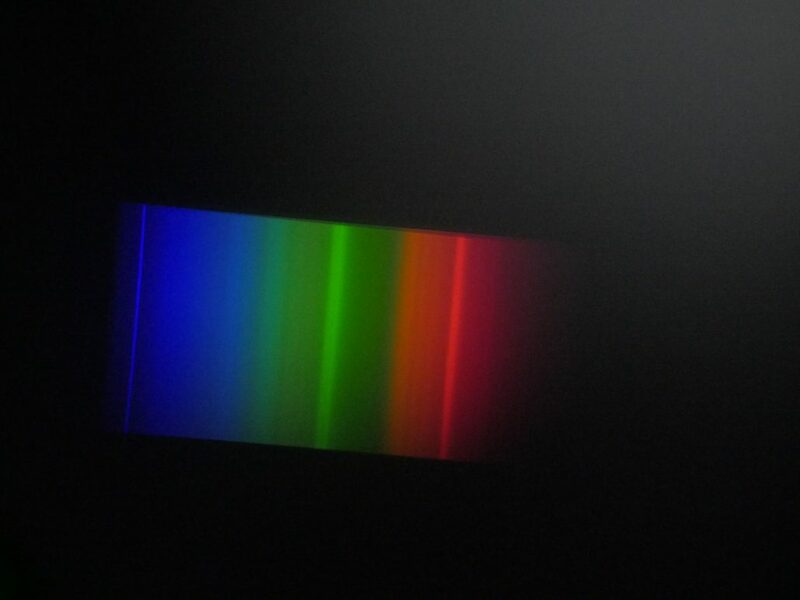 You’re probably here because your curious about light and want to know what to do next with your spectroscope. We’ll you’ve come to the right place! 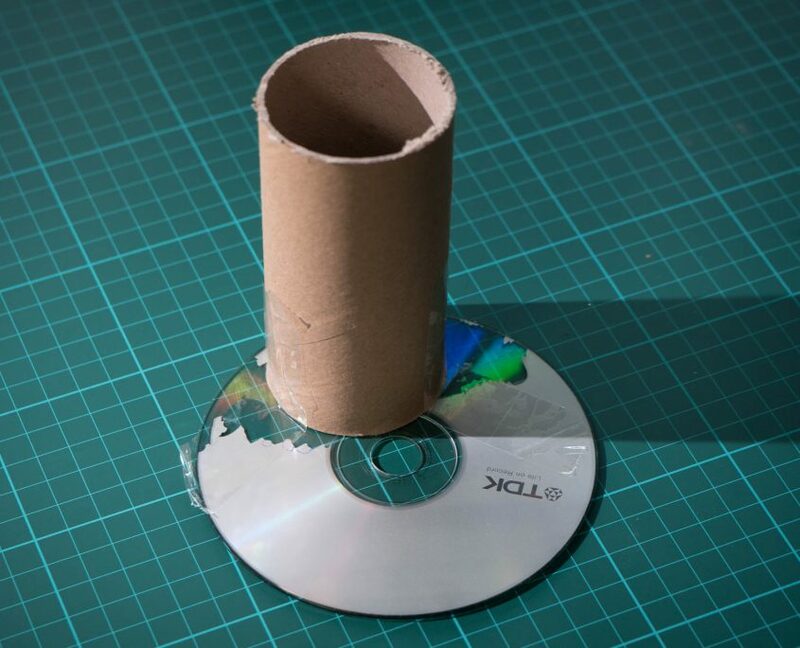 Big question number 1: how does this cardboard tube and CD thing (spectroscope) actually work? 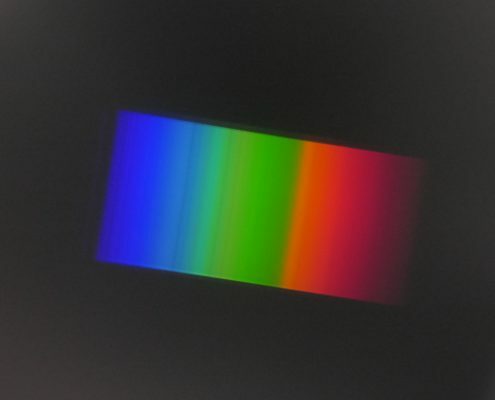 Your spectroscope works through a process called diffraction; when light is passed through a very narrow slit it is spread out into different wavelengths. 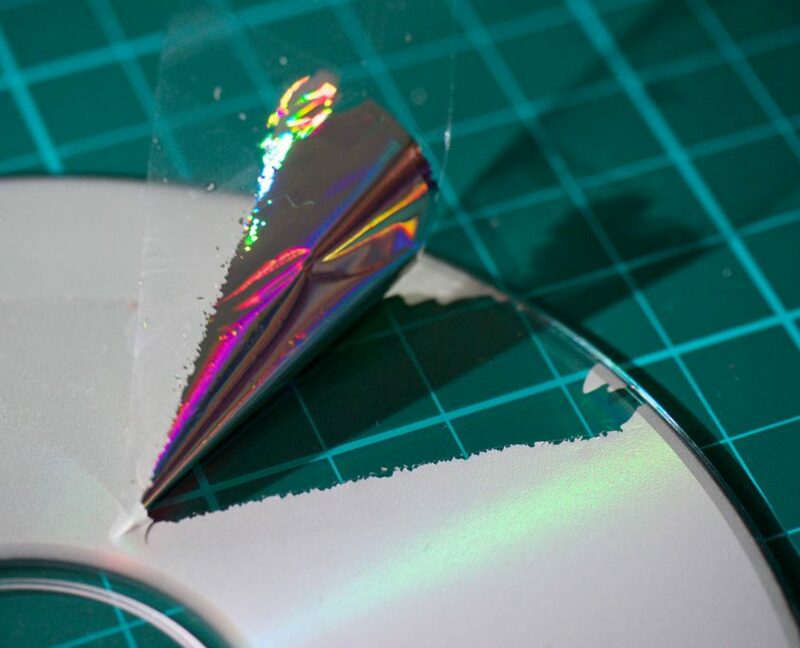 The CD contains lots of tiny slits which cause the light to split up into various different colours. 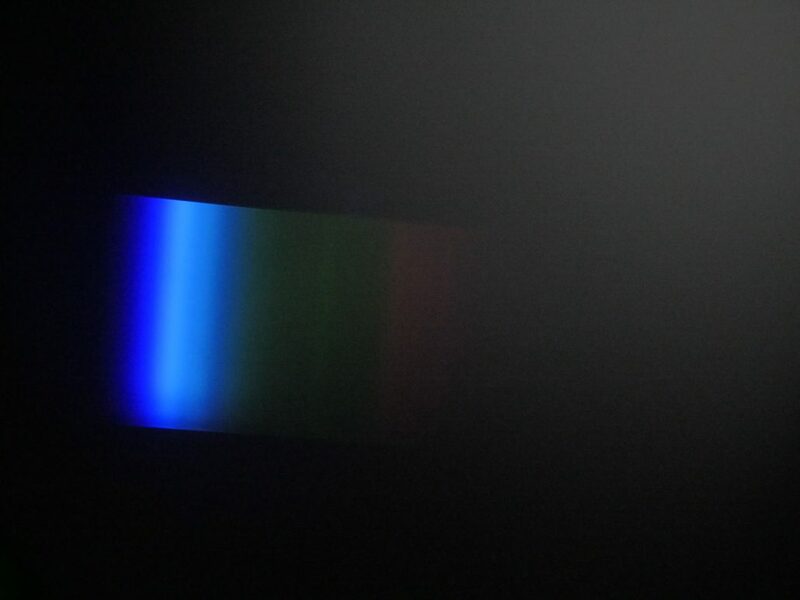 The small cardboard slit helps to create a narrower beam of light and makes things clearer (if you take away the slit the pattern becomes less clear – try it!). 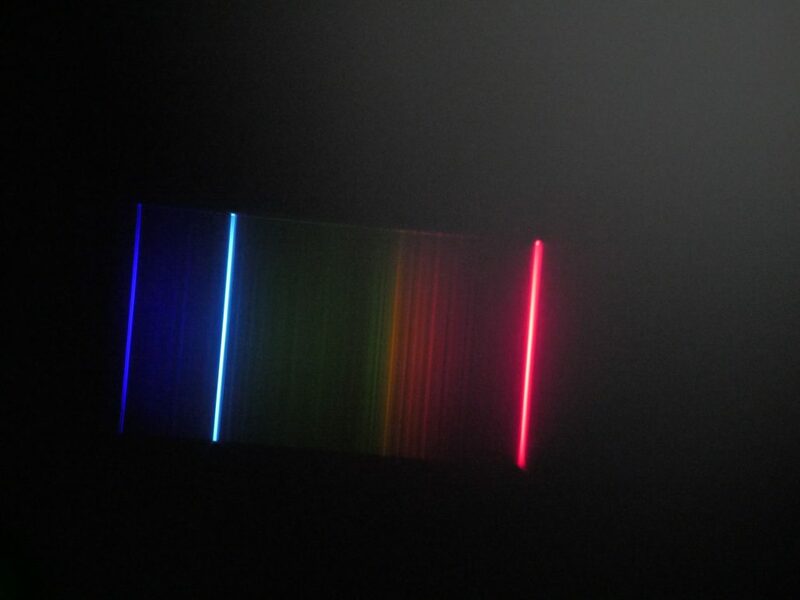 The different bands of colour you can see are light at different wavelengths. 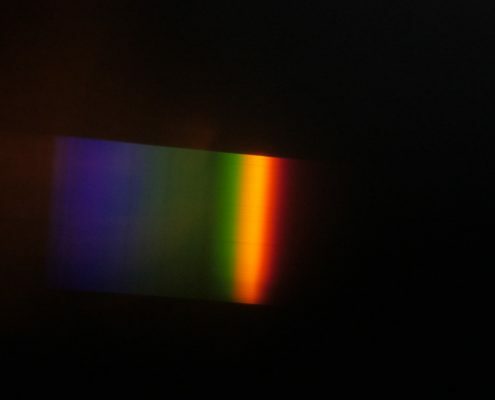 Light with a short wavelength sits towards the blue/purple end of the spectrum; light with a longer wavelength sits towards the red/orange end. 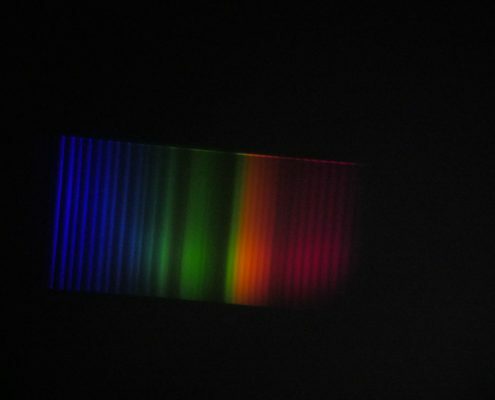 Big question number 2: what to do next? 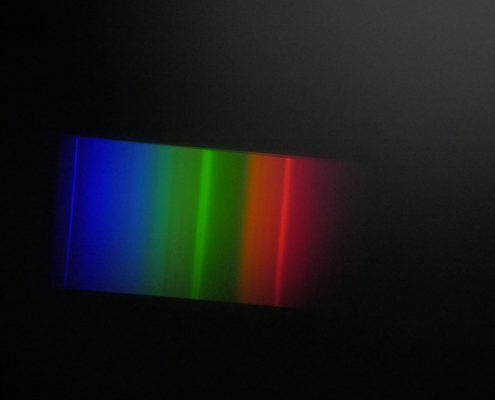 Take a look at the three sections below to find out what you can do with your spectroscope and how you can experiment further with light. 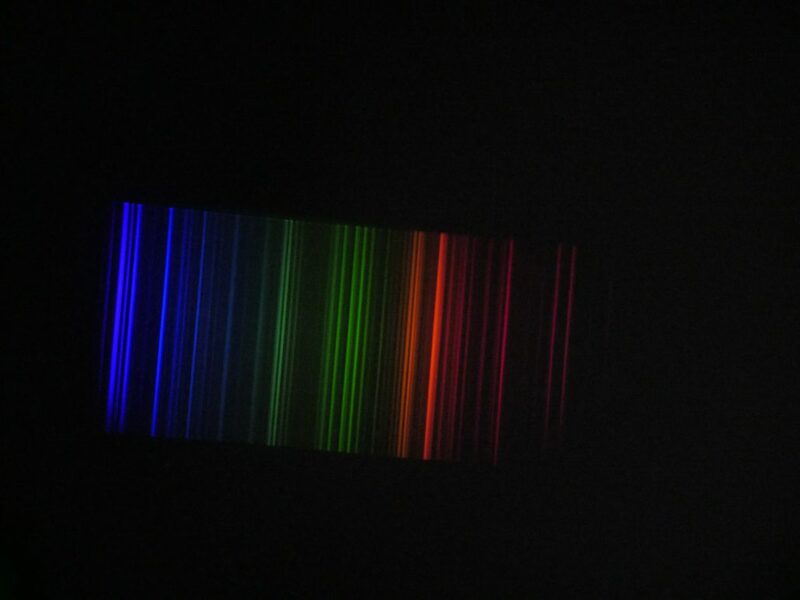 Investigation time! 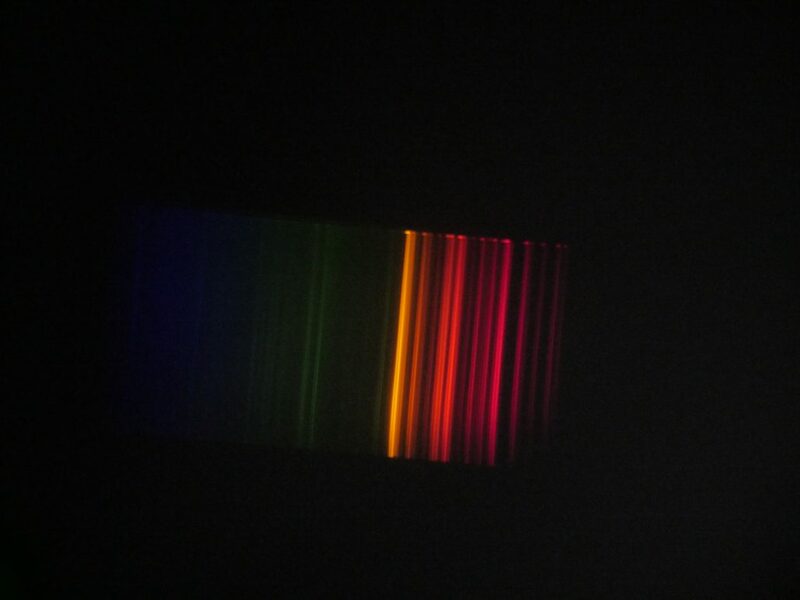 You’ll need your spectroscope, a source of light and a camera for this. 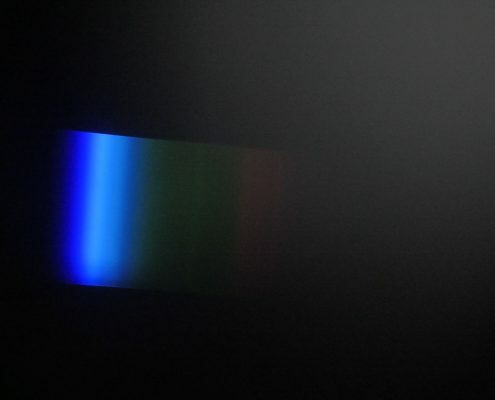 The camera on your mobile phone will work perfectly. 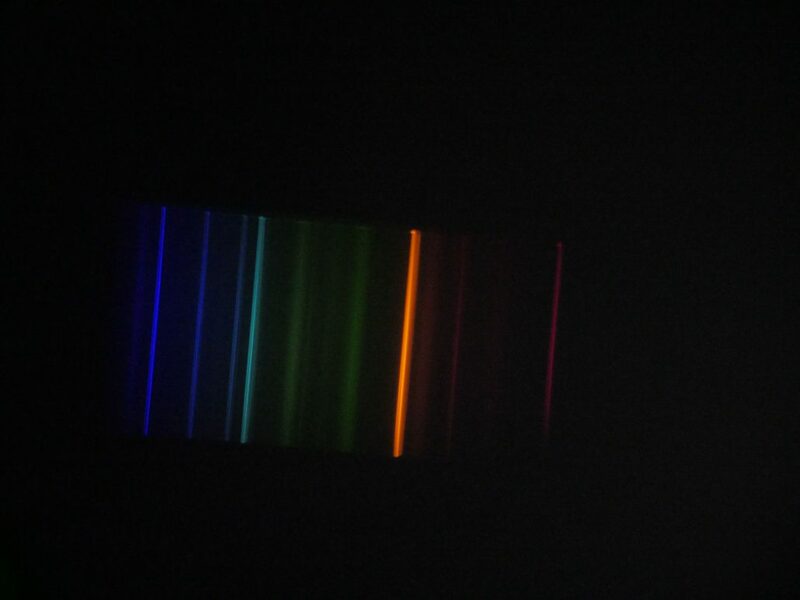 Choose a light source, maybe the screen of your computer, and point the spectroscope at it. 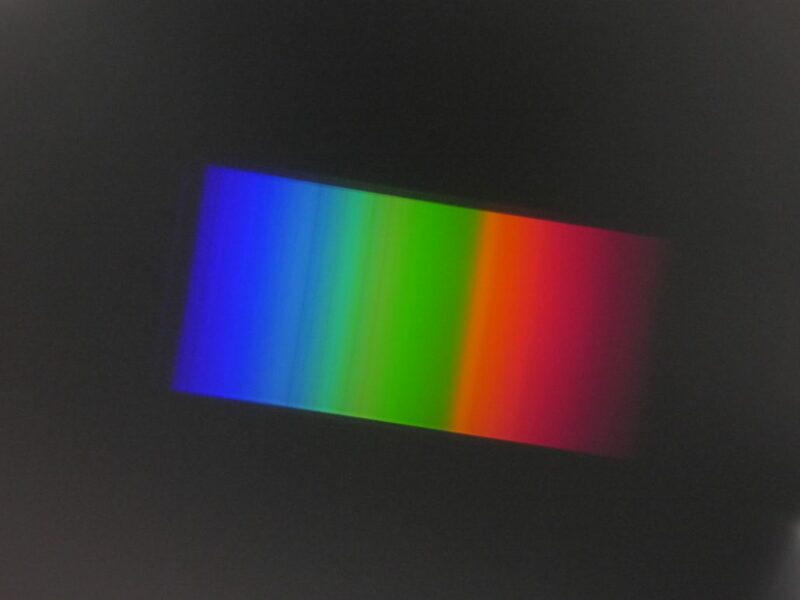 Then carefully take a photo through the spectroscope using your camera. This can get a bit awkward, don’t drop your phone! Don’t use your spectroscope to look directly at the sun. 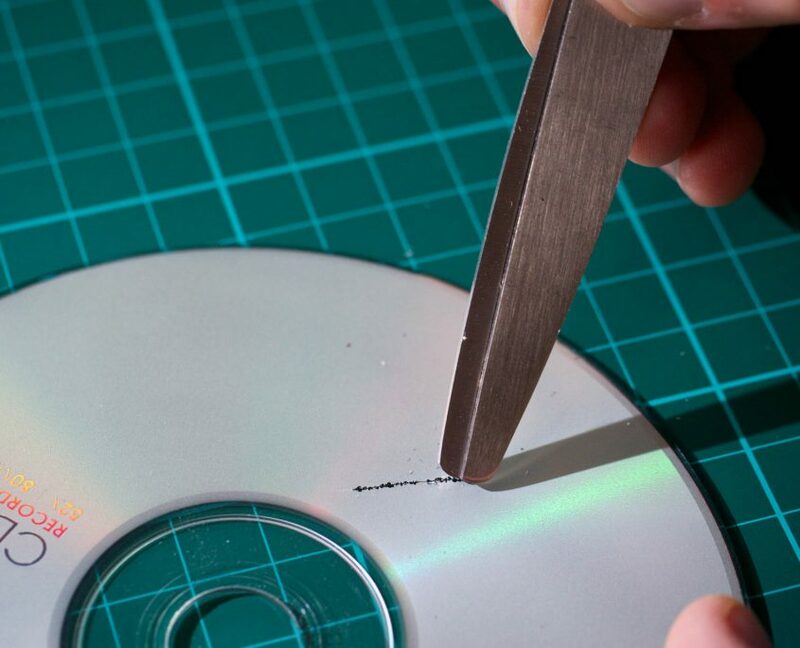 We’d prefer everyone doing this course to finish with just as much eyesight as they started. Thanks. 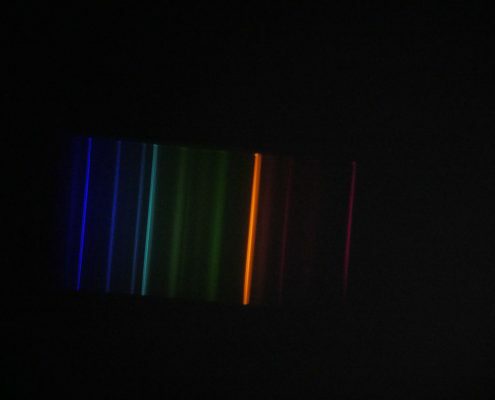 The colours you see depend upon the type of light source you’re looking at. 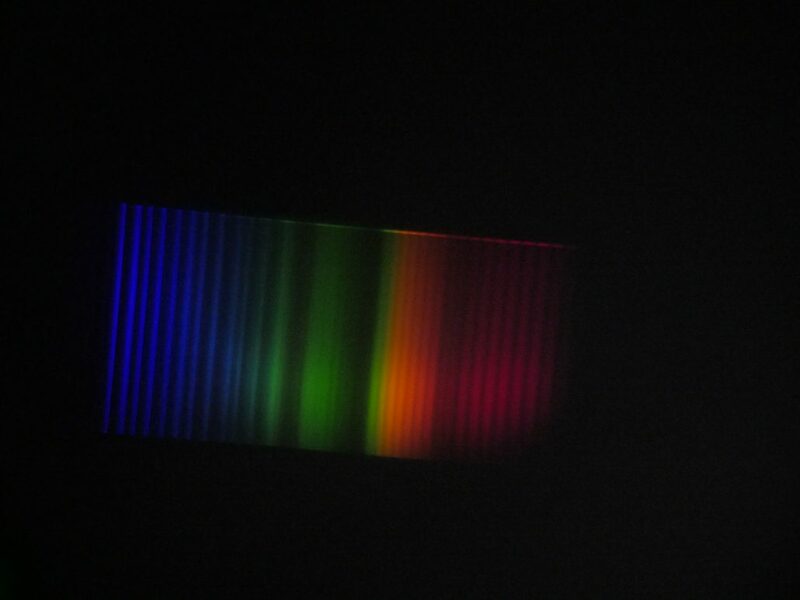 To be super-accurate, the colours depend on the chemical elements that are involved in giving off the light. 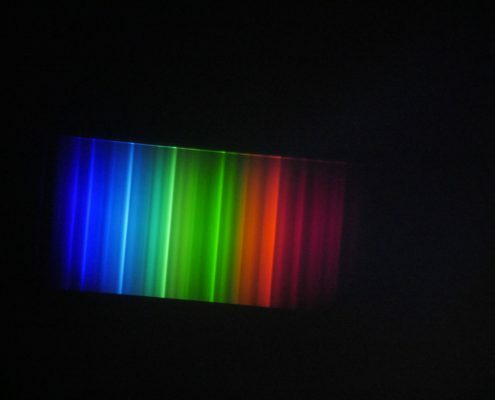 You’ll have heard of some elements before: oxygen, hydrogen, carbon, aluminium, and gold are all examples of elements. 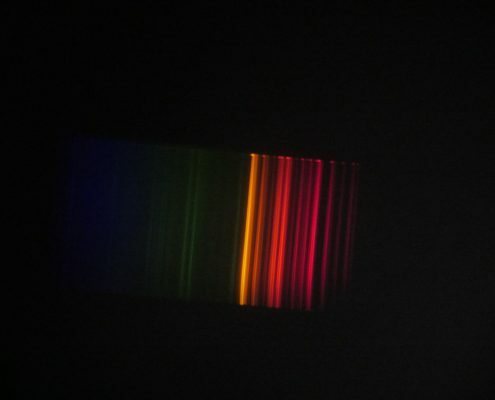 Different elements produce different patterns of colour – different spectra. 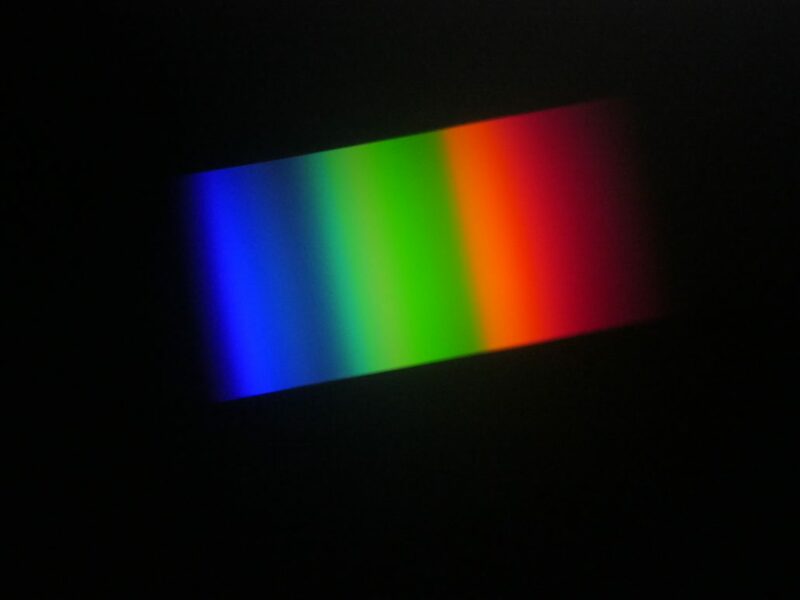 Typically, a light source that’s trying to represent white will use several elements, and hence several spectra, to produce a good enough blend to fool your eye into seeing pure white. 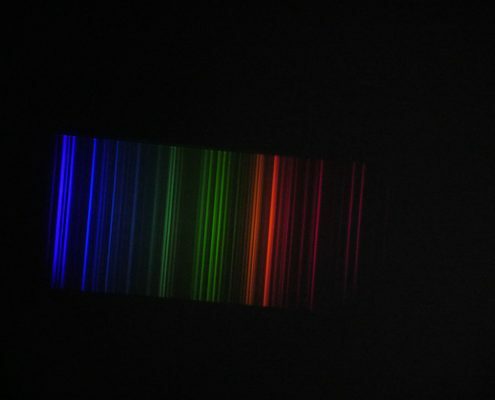 The pictures below show some images of common spectra. 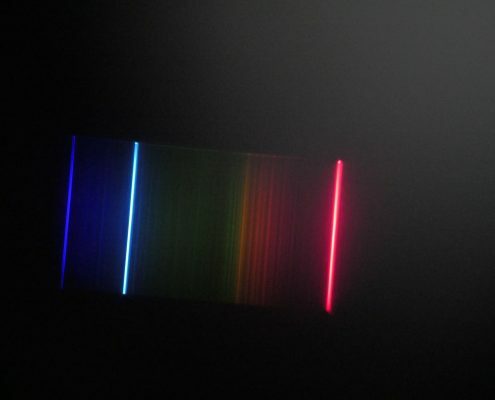 If you compare these with your photos you might be able to work out what elements are in use in your light sources. 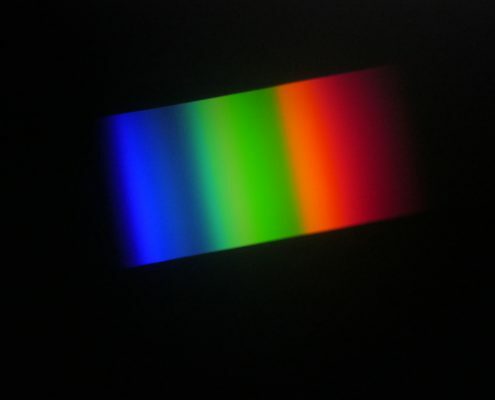 There’s lots of different ways you can explore the fascinating world of light. 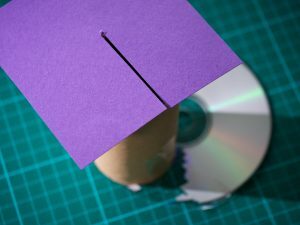 Here are three things you can do in your kitchen this weekend!